The Heart Sūtra (Sanskrit Prajñāpāramitāhṛdaya) is a famous sutra in Mahāyāna Buddhism. Its Sanskrit title, Prajñāpāramitāhṛdaya, literally means "The Heart of the Perfection of Understanding". The Heart Sūtra is often cited as the best-known and most popular Buddhist scripture of all. The text is very short, and it is generally believed to be Buddhist apocrypha written in China using excerpts of a translation of the Mahaprajnaparamita Sutra; see Nattier hypothesis below. The Heart Sūtra, belonging to the Perfection of Wisdom (Prajñāpāramitā) category of Mahāyāna Buddhism literature along with the Diamond Sutra, is perhaps the most prominent representative of the genre. The long version of the Sanskrit Heart Sutra is a prose text of some 280 words. In the Chinese version of the short text attributed to Xuanzang (T251), it has 260 Chinese characters. In English it is composed of sixteen sentences. This makes it one of the shortest texts in the Perfection of Wisdom genre, which contains scriptures in lengths up to 100,000 lines. "The Essence of Wisdom Sutra (Heart Sūtra) is much shorter than the other Perfection of Wisdom sūtras but it contains explicitly or implicitly the entire meaning of the longer Sutras." This sutra is classified by Edward Conze as belonging to the third of four periods in the development of the Prajnaparamita canon, although because it contains a mantra (sometimes called a dhāraṇī), it does overlap with the final, tantric phase of development according to this scheme, and is included in the tantra section of at least some editions of the Kangyur. Conze estimates the sutra's date of origin to be 350 CE; some others consider it to be two centuries older than that. Recent scholarship is unable to verify its existence before any date earlier than the 7th century CE. The Chinese version is frequently chanted (in Sino-Xenic pronunciations) by the Chan, Zen, Seon, and Thiền schools during ceremonies in China, Japan, Korea, and Vietnam respectively. It is also significant to Shingon Buddhism, whose founder Kūkai wrote a commentary on it, and to the various Tibetan Buddhist schools, where it is studied extensively. The sutra is in a small class of sutras not attributed to the Buddha. In some versions of the text, starting with that of Fayue dating to about 735, the Buddha confirms and praises the words of Avalokiteśvara, although this is not included in the preeminent Chinese version translated by Xuanzang. The Tibetan canon uses the longer version, although Tibetan translations without the framing text have been found at Dunhuang. The Chinese Buddhist canon includes both long and short versions, and both versions exist in Sanskrit. The earliest extant text of the Heart Sūtra is the palm-leaf manuscript found at the Horyuji Temple, and dated to 609 CE. It was one of two texts which formed the basis for a published edition by Max Müller (1881), and formed the basis of a published edition by Shaku Hannya (1923). (See image top right) However it is important to note that a comparison of the script with India manuscripts and inscriptions argues for a date in the 8th century for the Horyuji manuscript. A Chinese text attributed to Xuanzang and dated 649 CE (T251) is preserved in the Chinese Tripiṭaka. Stories exist of earlier translations but are likely to be apocryphal. In particular Edward Conze acknowledges that the text attributed to Kumarajīva (T250) is the work of his student. It is not mentioned a biography compiled in 519 CE. John McRae and Jan Nattier have argued that this translation was created by someone else, much later, based on Kumarajiva's Large Sūtra (T233). Zhi Qian's version, supposedly composed in 200-250 CE, was lost before the time of Xuanzang, who produced his own version in 649CE, which closely matches the one attributed to Kumarajiva. Xuanzang's version is the first record of the title "Heart Sūtra" (心經 xīnjīng) being used for the text, and Fukui Fumimasa has argued that 心經 actually means dhāraṇī scripture. According to Huili's biography, Xuanzang learned the sutra from an inhabitant of Sichuan, and subsequently chanted it during times of danger in his journey to the West. There have been several critical editions of the Sanskrit text of the Heart Sūtra, including Müller (1881) and Vaidya (1961). To date the definitive edition is Conze's, originally published in 1948, reprinted in 1967 and revised in 1973. Conze had access to 12 Nepalese manuscripts; seven manuscripts and inscriptions from China; two manuscripts from Japan; as well as several translations from the Chinese Canon and one from the Tibetan. There is a great deal of variation across the manuscripts in the title, the maṅgala verses, and within the text itself. Many of the manuscripts are corrupt or simply carelessly copied. In 2014, Attwood described a previously unknown manuscript of the long version of the Heart Sutra, then in 2015 published an article highlighting a mistake in Conze's critical edition. Jonathan Silk (1994) produced a critical edition of the Tibetan Kanjur version. The Kanjur only contains the long text, in two recensions, however a number of short texts in Tibetan were found at Dunhuang. One has been published, but there has been no study of these texts to date. However, based on textual patterns in the Sanskrit and Chinese versions of the Heart Sūtra and the Mahaprajnaparamita Sutra, scholar Jan Nattier has suggested that the earliest (shortest) version of the Heart Sūtra was probably first composed in China in the Chinese language from a mixture of material derived from Kumārajīva's Chinese translation of the Large Perfection of Wisdom Sutra (cf. vol. 1-1, pg 64 of Takaysu 2007) and new composition, and that this assemblage was later translated into Sanskrit (or back-translated, in the case of most of the sutra). She argues that the majority of the text was redacted from Kumārajīva's Larger Sutra on the Perfection of Wisdom, which had originated with a Sanskrit Indian original, but that the "framing" passages (the introduction and concluding passages) were new compositions in Chinese by a Chinese author and that the text was intended as a dhāraṇī rather than a sutra. The Chinese version of the core (i.e. the short version) of the Heart Sūtra matches a passage from the Large Sutra almost exactly, character by character; but the corresponding Sanskrit texts, while agreeing in meaning, differ in virtually every word. Furthermore, Nattier argues that there is no evidence (such as a commentary) of a Sanskrit version before the 8th century, and she dates the first evidence (in the form of commentaries by Xuanzang's disciples Kuiji and Woncheuk, and Dunhuang manuscripts) of Chinese versions to the 7th century. She considers attributions to earlier dates "extremely problematic". In any case, the corroborating evidence supports a Chinese version at least a century before a Sanskrit version. The Zhi Qian version is titled Po-jo po-lo-mi shen-chou i chuan (i.e. 般若波羅蜜神咒一巻) or Prajñāpāramitā Mantra in One Volume; the Kumarajiva version is titled Mo-ho po-jo po-lo-mi shen-chou i chuan (i.e. 摩訶般若波羅蜜神咒一巻) or Mahārajñāpāramitā Mantra in One Volume. Xuanzang's translation was the first to use 心 xīn ("Heart") in the title. Despite the common name Heart Sūtra, the word sūtra is not present in known Sanskrit manuscripts, which refer to it simply as prajñāpāramitāhṛdaya. Xuanzang's translation was also the first to call the text a sutra. No extant Sanskrit copies use this word, though it has become standard usage in Chinese and Tibetan, as well as English. Some citations of Zhi Qian's and Kumarajiva's versions prepend 摩訶 moho (which would be mahā in Sanskrit) to the title. Some Tibetan editions add bhagavatī, meaning "Victorious One" or "Conqueror", an epithet of Prajnaparamita as goddess. Various commentators divide this text into different numbers of sections. Briefly, the sutra describes the experience of liberation of the bodhisattva of compassion, Avalokiteśvara, as a result of vipassanā gained while engaged in deep meditation to awaken the faculty of prajña (wisdom). The insight refers to apprehension of the fundamental emptiness (śūnyatā) of all phenomena, known through and as the five aggregates of human existence (skandhas): form (rūpa), feeling (vedanā), volitions (saṅkhāra), perceptions (saṃjñā), and consciousness (vijñāna). The specific sequence of concepts listed in lines 12-20 ("...in emptiness there is no form, no sensation, ... no attainment and no non-attainment") is the same sequence used in the Sarvastivadin Samyukta Agama; this sequence differs in comparable texts of other sects. On this basis, Red Pine has argued that the Heart Sūtra is specifically a response to Sarvastivada teachings that, in the sense "phenomena" or its constituents, are real. Lines 12-13 enumerate the five skandhas. Lines 14-15 list the twelve ayatanas or abodes. Line 16 makes a reference to the eighteen dhatus or elements of consciousness, using a conventional shorthand of naming only the first (eye) and last (conceptual consciousness) of the elements. Lines 17-18 assert the emptiness of the Twelve Nidānas, the traditional twelve links of dependent origination. Line 19 refers to the Four Noble Truths. Avalokiteśvara addresses Śariputra, who was the promulgator of abhidharma according to the scriptures and texts of the Sarvastivada and other early Buddhist schools, having been singled out by the Buddha to receive those teachings. Avalokiteśvara famously states, "Form is empty (śūnyatā). Emptiness is form", and declares the other skandhas to be equally empty – that is, dependently originated. Avalokiteśvara then goes through some of the most fundamental Buddhist teachings such as the Four Noble Truths and explains that in emptiness none of these notions apply. This is interpreted according to the two truths doctrine as saying that teachings, while accurate descriptions of conventional truth, are mere statements about reality – they are not reality itself – and that they are therefore not applicable to the ultimate truth that is by definition beyond mental understanding. Thus the bodhisattva, as the archetypal Mahayana Buddhist, relies on the perfection of wisdom, defined in the Mahaprajnaparamita Sutra to be the wisdom that perceives reality directly without conceptual attachment. This perfection of wisdom is condensed in the mantra with which the sutra concludes. It is unusual for Avalokiteśvara to be in the central role in a Prajñāpāramitā text. Early Prajñāpāramitā texts involve Subhuti, who is absent from both versions of the Heart Sūtra, and the Buddha who is only present in the longer version. This could be considered evidence that the text is Chinese in origin. In the traditions of Chinese Buddhism in East Asia, it is said that the Indian masters who came to China to translate Sanskrit texts never translated mantras into Chinese because they knew this could not be done. They also held that it was impossible to explain the esoteric meanings of the mantras in words. It is said that when a devotee succeeds in realizing singleness of mind (samādhi) by repeating a mantra, then its profound meaning will be clearly revealed to him or her. Two commentaries of the Heart Sutra were composed by pupils of 玄奘 Xuánzàng in the late 7th or early 8th century, 원측 [Woncheuk] and 窺基 [Kuījī]. These have both been translated into English (Hyun Choo 2006; Shih & Lusthaus 2006). They approach the text from a Yogācāra point of view and thus provide a contrast with the Indian and Tibetan commentaries which are from Madhyamaka and Tantric view points. One feature of these commentaries [in Tibetan] on the Heart Sūtra struck me quite forcibly: each commentary seemed so different to the others, and yet they all seemed to show in greater or lesser degree the influence of the Mādhyamika school of Buddhist philosophy. The question still remains of the exact function of the mantra within the sutra, because the sutra provides no such explanation and the sadhanas make only perfunctory references to the mantra. Tibetan exegesis of the mantra tends to look back on it from a Tantric point of view. For instance seeing it as representing progressive steps along the five paths of the Bodhisattva, through the two preparatory stages (the path of accumulation and preparation – gate, gate), through the first part of the first bhūmi (path of insight – pāragate), through the second part of the first to the tenth bhūmi (path of meditation – pārasamgate), and to the eleventh bhūmi (stage of no more learning – bodhi svāhā). The 14th Dalai Lama explains the mantra both as an instruction for practice and as a device for measuring one's own level of spiritual attainment, and translates it as "go, go, go beyond, go thoroughly beyond, and establish yourself in enlightenment". In the discourse, he gives a similar explanation to the four stages (the four "go"s) as in the previous paragraph. Edward Conze attempted to render the mantra into English as: "gone gone, gone beyond, gone altogether beyond, O what an awakening, all hail!" There are several approaches to translating the mantra, most of which assume that the mantra obeys the rules of Classical Sanskrit. However, the string of words resists analysis and, like most mantras, is not a grammatical sentence. The Heart Sūtra has been set to music a number of times. Many singers solo this sutra. The Buddhist Audio Visual Production Centre (佛教視聽製作中心) produced a Cantonese album of recordings of the Heart Sūtra in 1995 featuring a number of Hong Kong pop singers, including Alan Tam, Anita Mui and Faye Wong and composer by Andrew Lam Man Chung (林敏聰) to raise money to rebuild the Chi Lin Nunnery. Other Hong Kong pop singers, such as the Four Heavenly Kings sang the Heart Sūtra to raise money for relief efforts related to the 921 earthquake. An alternative Mandarin version was performed by Faye Wong in 2009 at the Famen Temple and its recording subsequently used as a theme song in the blockbusters Aftershock (2010) and Xuanzang (2016). Shaolin Monk Shifu Shi Yan Ming also recites the Sutra at the end of the song "Life Changes" by the Wu-Tang Clan, in remembrance of the deceased member ODB. The outro of the b-side song Ghetto Defendant by the British first wave punk band The Clash also features the Heart Sūtra, recited by American beat poet Allen Ginsberg. A slightly edited version is used as the lyrics for Yoshimitsu's theme in the PlayStation 2 game Tekken Tag Tournament. An Indian styled version was also created by Bombay Jayashri title named - Ji Project. It was also recorded and arranged by Malaysian singer/composer Imee Ooi. An Esperanto translation of portions of the text furnished the libretto of the cantata La Koro Sutro by American composer Lou Harrison. In the centuries following the historical Xuanzang, an extended tradition of literature fictionalizing the life of Xuanzang and glorifying his special relationship with the Heart Sūtra arose, of particular note being the Journey to the West (16th century/Ming dynasty). In chapter nineteen of Journey to the West, the fictitious Xuanzang learns by heart the Heart Sūtra after hearing it recited one time by the Crow's Nest Zen Master, who flies down from his tree perch with a scroll containing it, and offers to impart it. A full text of the Heart Sūtra is quoted in this fictional account. The mantra of the Heart Sūtra was used as the lyrics for the opening theme song of the 2011 Chinese television series Journey to the West. ↑ Taisho Tripitaka Vol. T08 No. 251, attributed to Xuanzang. ↑ "Tibetan Version of the Heart Sutra (English)". Dharmaweb. 2005-10-29. Retrieved 2013-03-16. ↑ Vaidya, P.L (1961) Mahāyāna-sūtra-saṃgrahaḥ ( part 1). The Mithila Institute of Post-Graduate Studies and Research in Sanskrit Learning. ↑ Silk, Jonathan A. (1994) The Heart Sūtra in Tibetan: a Critical Edition of the Two Recensions Contained in the Kanjur. Arbeitskreis für Tibetische und Buddhistische Studien, Universität Wien. ↑ Zwalf, W. (1985) Buddhism, Art and Faith. p. 61, 64. London: British Museum. Also International Dunhuang Project. http://idp.bl.uk/database/large.a4d?recnum=7852&imageRecnum=122101 (Record has no date). ↑ "佛學多媒體資料庫". Buda.idv.tw. Retrieved 2013-03-16. ↑ "經典讀誦心經香港群星合唱迴向1999年, 台灣921大地震". Youtube.com. 2012-08-10. Retrieved 2013-03-16. ↑ …ist denen, in welchen der Wille sich gewendet und verneint hat, diese unsere so sehr reale Welt mit allen ihren Sonnen und Milchstraßen — Nichts. Conze, Edward (1948). Text, Sources, and Bibliography of the Prajñāpāramitā-hṛdaya. Journal of the Royal Asiatic Society, April 80(1-2): 33-51. Hyun Choo, B. (2006) 'An English Translation of the Banya paramilda simgyeong chan: Wonch'uk's Commentary on the Heart Sūtra (Prajñāpāramitā-hṛdaya-sūtra)' International Journal of Buddhist Thought & Culture. February 2006, Vol.6, pp. 121–205. Kimura, Takayasu. (2007) Pañcaviṃśatisāhasrikā Prajñāpāramitā Vol. I-1, Tokyo: Sankibo Busshorin 2007. online [Input by Klaus Wille, Göttingen, April 2010]. Nattier, Jan. (1992)'The Heart Sūtra: A Chinese Apocryphal Text?'. Journal of the International Association of Buddhist Studies Vol. 15 (2), 1992. p.153-223. Wayman, Alex. (1990) 'Secret of the Heart Sutra.' in Buddhist insight: essays Motilal Banarsidass Publ., 1990. pp. 307–326. ISBN 81-208-0675-1. Yu, Anthony C. (1980). The Journey to the West. Chicago and London: The University of Chicago Press. ISBN 978-0-226-97150-6. First published 1977. Conze, Edward (translator) (1984). Perfection of Wisdom in Eight Thousand Lines & Its Verse Summary. Grey Fox Press. ISBN 978-0-87704-049-1. Lopez, Donald (1990). The Heart Sutra Explained. South Asia Books. ISBN 978-81-7030-238-4. McLeod, Ken (2007). An Arrow to the Heart. Victoria, BC, Canada: Trafford. ISBN 978-1-4251-3377-1. Nhat Hanh, Thich (1988). The Heart of Understanding. Berkeley, California: Parallax Press. ISBN 978-0-938077-11-4. Porter, Bill (Red Pine) (2004-08-31). The Heart Sutra: The Womb of Buddhas. Shoemaker & Hoard. ISBN 978-1-59376-009-0. Waddell, Norman (1996-07-15). Zen Words for the Heart: Hakuin's Commentary on the Heart Sutra. Boston, Massachusetts: Shambhala. ISBN 978-1-57062-165-9. Gyatso, Tenzin, The Fourteenth Dalai Lama (2002). Jinpa, Thumpten, ed. Essence of the Heart Sutra: The Dalai Lama's Heart of Wisdom Teachings. English Translation by Geshe Thupten Jinpa. Boston: Wisdom Publications. ISBN 0-86171-318-4. Hasegawa, Seikan (1975). The Cave of Poison Grass: Essays on the Hannya Sutra. Arlington, Virginia: Great Ocean Publishers. ISBN 0-915556-00-6. Fox, Douglass (1985). The Heart of Buddhist Wisdom: A Translation of the Heart Sutra With Historical Introduction and Commentary. Lewiston/Queenston Lampeter: The Edwin Mellen Press. ISBN 0-88946-053-1. Shih, Heng-ching, trans. (2001). A comprehensive commentary on the Heart Sutra (transl. from the Chinese of K'uei-chi). Berkeley, Calif.: Numata Center for Buddhist Translation and Research. ISBN 1-886439-11-7. "The Shorter Prajñāpāramitā Hṛdaya Sūtra". Lapis Lazuli Texts. Retrieved 2010-08-30. From the Chinese translation by Xuanzang (T08n251). 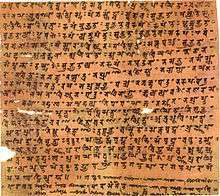 "The Longer Prajñāpāramitā Hṛdaya Sūtra". Lapis Lazuli Texts. Retrieved 2010-08-30. From the Chinese translation by Prajñā (T08n253). "The Heart of the Perfection of Wisdom". LamRim.com. Retrieved 2008-03-22. From the Tibetan text. Wikimedia Commons has media related to Heart Sutra.